Ok, first things first: I buy plenty of things. New things, even. And I’m not shaming anyone who does the same. But it can be too easy to believe that you can buy your way to happiness, and though it can sometimes work on a small scale, it’s pretty unsustainable for individuals and the planet in the long term. 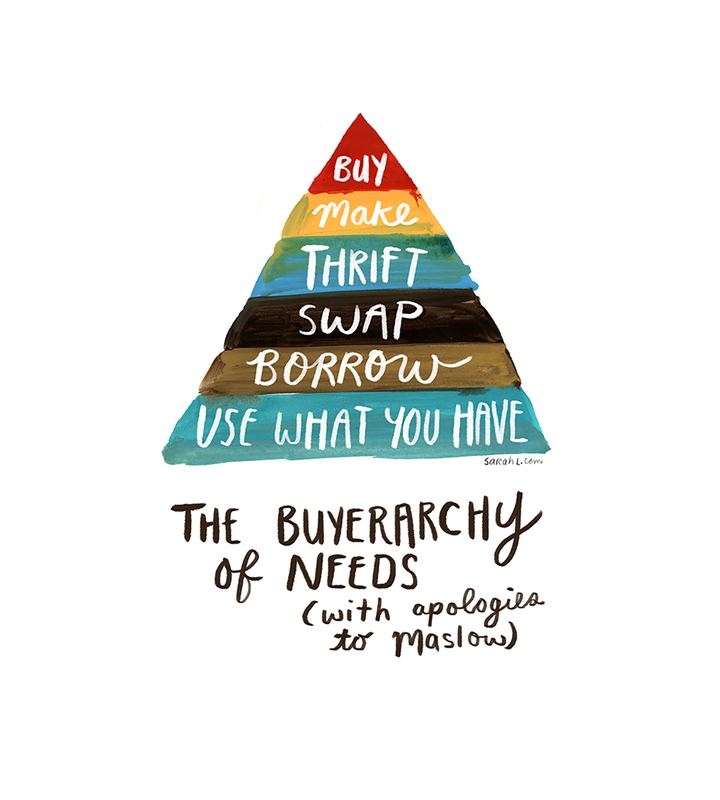 While browsing Instagram recently, I came across the “buyerarchy of needs” by artist Sarah Lazarovic, and I loved the sentiment behind it, that buying new shouldn’t be your first and only way of acquiring the stuff you need. On today’s consumer culture holiday that kicks off the season of consumerism, it’s a good reminder that you don’t have to “shop ’til you drop” (and you probably shouldn’t). The artist states that “you’re free to share, print, tattoo it on your person,” so I decided to do a few of those. I enlarged the original to print it to fit on an 8 1/2″ by 11″ piece of nice, thick paper, then trimmed the paper to fit into an 8″ by 10″ frame I already had. thank you for the buyerarchy of needs, it is worthy of imitation. I just want to add one point, which is important to me. Instead of “buy”, it could be “buy fair”. Unfair working conditions and payment is a big problem in Europe and I guess, it is not different in America. Birgit, that’s a really good point! We like to pretend that if we can’t see the bad working conditions they don’t exist, but they certainly do. I think in America it’s more of a problem of buying stuff from other countries without laws protecting workers, but there’s no doubt some unfair conditions going on here, too. I’m definitely making one of these up for myself. Especially at the computer. I’ve been shopping (overly most the time!) online for almost 13 years now but since I returned to sewing (almost 3 years ago after an almost 40 yr hiatus) this online shopping habit has reached ridiculous and somewhat gargantuan proportions 🙁 Having this beside me while I sit at my cpu will hopefully help. THank you! Sometimes it’s hard to resist when practically everything is right at our fingertips. I hope being conscious of it helps, though! This is totally getting posted where my teens (18, 16 & 14) can see it. Hubby & I can use a visual reminder too! Thanks for sharing it.